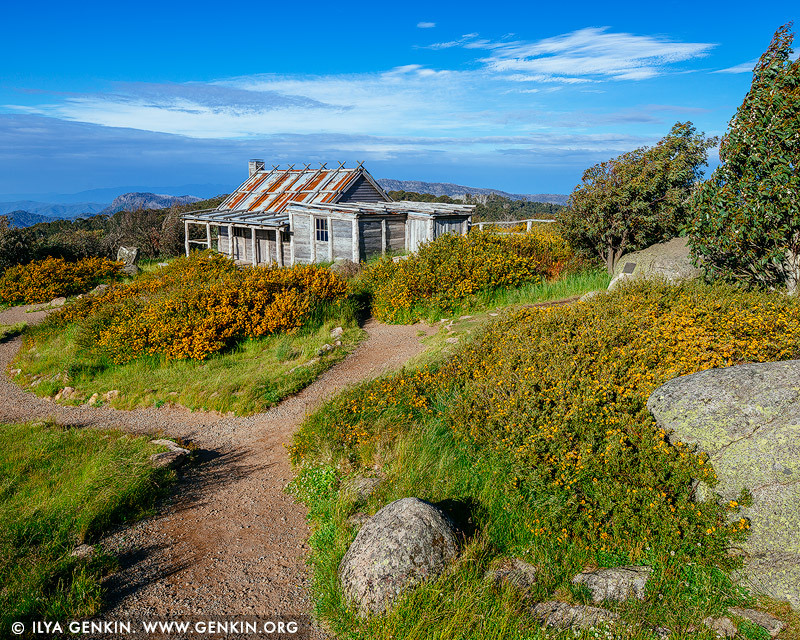 Craig's Hut - one of the most famous High Country huts. Perched atop Mt Stirling, Craig's Hut offers stunning views of the ranges and is one of the regions most photographed landmarks. First built as a set for The Man From Snowy River film in 1981–82, the hut has now become an iconic symbol of Australia's settler history. In 2006 the Craig's Hut was burnt down by bushfires. It was completely rebuilt and reopened to the public in January 2008. It is situated on Mt Stirling, approximately 51 kilometres from Mansfield. The last 1.2 kilometres is only accessible by 4WD or via the walking track from the Day Visitor Area. Access tracks via Mt Stirling are closed to vehicles for Winter. This image belongs to the travel and nature stock photo library. This stock photo of Craig's Hut is available for licensing for commercial and editorial uses including websites, blogs, books, magazines, brochures and advertising. Restrictions may apply for images which contain third party copyrighted material or sensitive subjects. Photos of artwork are for editorial use only. This image id AU-MANSFIELD-CRAIGS-HUT-0003 of Craig's Hut, is copyrighted © by Ilya Genkin. This is not a public domain image.